The brief meeting which was held at “Ome udo’s palace” in Afaraukwu Ibeku, Umuahia, on the 2nd day of April 2019, featured few IPOB Abia Women Executives which include Mrs. Scholar, Mrs. Nwaigwe, Mrs. Amadi, Mrs. Okpara Eke, Mrs. Onyekachi and few others who came from various parts of Abia State, started at exactly 13 minutes before 1pm Biafra time. 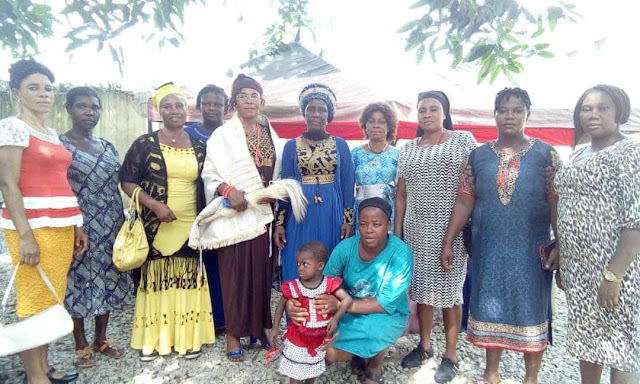 After the opening prayer said by the Biafra Land women leader, Uzoamaka Ejezie, she went further to encourage and address the women who were present at the meeting. “You all know that in a family, that the successfulness of the man is measured by the unity between him and his wife…if the husband and wife are not in good terms, it will affect the family so much and there will be no progress in the activities of the family. “I want to thank you all for coming out en masse to support our leader Mazi Nnamdi Kanu. He called out and you all answered him. Furthermore she said; "I want to also thank our leader Mazi Nnamdi Kanu for uniting us and opening our eyes. He took the risk that we may survive. He went to prison that we may be free. "I fought the war and I know what it means to be rounded up by your enemies from all angles, but it’s only a tree that you will inform that you are coming to bring it down and it will wait without making a move, but in the case of animals, human beings and so on they will always make a move just like our leader did when they (The Nigerian Armed forces) came for him here in Afaraukwu Ibeku." She continued, "I called you people today to inform you all on what is going on in Biafra land and for us to discuss on how to move the restoration project to the next level. We are tired of seeing our children going through the desert and Mediterranean sea just to look for greener pastures but end up dying on the way to Europe. To be honest what is going on in Biafra Land is so much; Most of our people have been bought by Nigerian murderous agents, so you must be careful. Let’s join our hands together and live in peace and harmony because once we are united we will level any type of mountain regardless of the height and size. Always pray for our leader and his family wherever you are, same way you commit your family to the hands of God." In conclusion she echoed, “In a short while you will sleep in Nigeria and wake up in Biafra”. “Don’t listen to side talks, remain focused, even if fire burns your work, it will still remain, a man can’t shine without a virtuous woman by his side, it is the gold in a woman that shines and prospers the man, that’s why I always advise men to stop humiliating their wives because the woman has always been a source of blessing to the man, just as the scripture says that he that finds a wife finds a good thing…..”. Finally, they discussed on their current agenda and Halleluyah Nwachukwu prayed for them and everyone went home rejoicing.